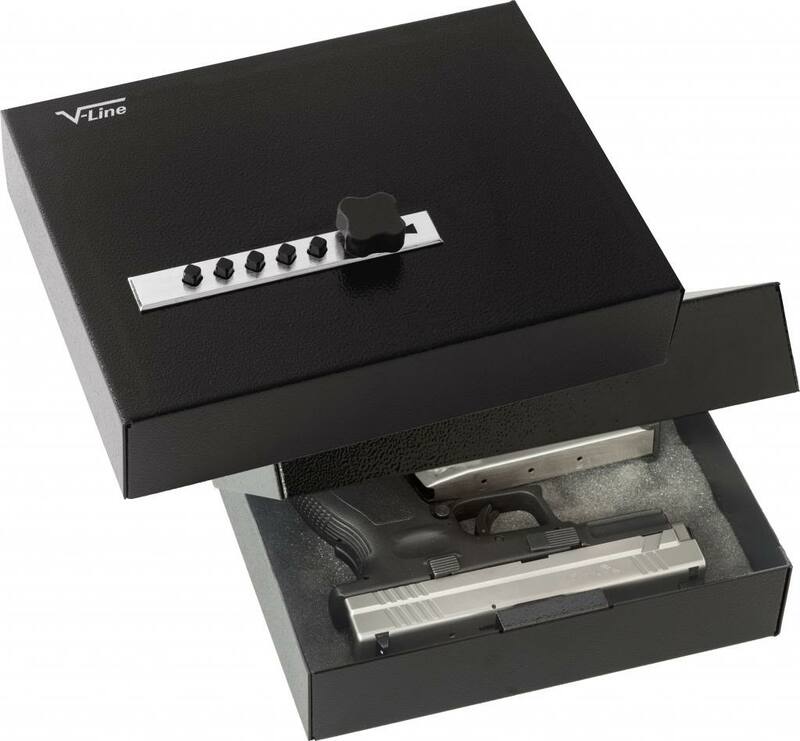 V-Line's compact security case offers a convenient way to store handguns, prescription medications, collectibles, and other small personal belongings. The locking mechanism is easy to use, yet still provides protection against your small valuables from getting in the wrong hands. • Top-opening security case with classic, slim design. • Five button mechanical lock for quick access (provides 1081 possible combinations). • Sturdy fabricated steel construction with pry resistant clamshell design. • Manufactured from 3/8-inch (10 mm) thick steel. • Lock-block welding covers the case's guides and adds strength to the lock bolt. • Continuous hinge is welded on one end to prevent pin removal. • Elongated hole in the back provides an anchor point for a cable or pad lock. • Foam lining on top and bottom. • Available in textured semi-gloss black powder coated finish. • Accented with gold tone pinstripe and logo.